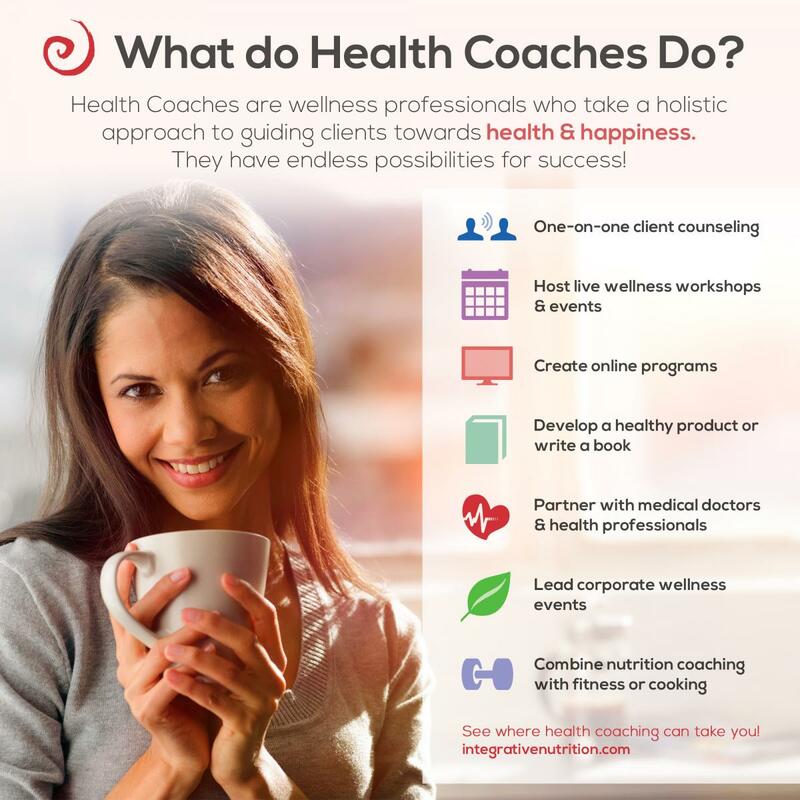 What does a health and wellness coach do? So if you are a fan of the Oprah T.V show, chances are you may have seen a few episodes where she’s had a guest lifestyle and wellness coach come on to share their secrets for living a fun and healthy life. They often share inspiring stories of how a major health challenge in their life helped shape their decision to embrace a healthier lifestyle. Health coaches are increasingly being employed in corporations. While this is part of what a health and wellness coach does, it is by no means the only thing they do. These new breed of professionals are committed to helping people achieve optimum well-being through the provision of nutrition, fitness, and mental health-related information as well as the incorporation of specific tools needed to achieve their health/wellness goals. They combine the art and science of achieving a healthy lifestyle with coaching best practices to help you find the inner motivation you need to make the lasting lifestyle changes you need to achieve your health and wellness objectives. Think of it as a buddy system for helping you achieve the kind of life you want. This is why it may seem to you like they never run out of motivational quotes and inspirational stories to share; a very good wellness coach would never want you to feel like you are alone in your struggles. Experts believe that sharing success stories motivates people to strive for excellence as it engages their imaginations and emotions, causing them to see all that they are capable of becoming. To become a wellness coach, first, you should have made a strong commitment to being well and happy – it has to be something you enjoy doing. Secondly, you’ll need to be a great people person – this means you are great at establishing relationships and can communicate effectively with people irrespective of age, social class or occupation. In addition to both requirements above, you are a great listener and would jump at the opportunity to counsel someone you think needs some sort of mental push. If all these apply to you, then this might just be the career for you. With persistent illnesses, make necessary changes to improve their quality of life. Create customized programs to fit their everyday lifestyle. Get the body they have always dreamed of. Ultimately gain back their confidence and freedom. So what it’s going to take to achieve this vision? There is nothing as revolting and discouraging as an overweight fitness coach, you have got to take out the log in your eye before tending to the splinter in your prospective client’s eye. A great place to begin is always high school. Getting fit is a process that takes time; the time required to build a habit of it. So take the time to develop a proper fitness routine; don’t skimp out on PE classes or food and nutrition classes either. What’s important is that you build a fitness culture that would become a part of you. High school is also the best place to get advice on what college programs would make your dream a reality. Embark on summer jobs that are geared towards staying fit and eating healthy; you can try getting a position with a purely vegetarian restaurant or one at the gym. If you are reading this and you’re way past your teens, don’t fret: it’s not too late to get started on your journey. Educate yourself by reading books, ask the right people the right questions and then make the necessary changes. To become a professional health coach would require you undergoing some form of professional training just like every other profession. The first step towards achieving this is getting a degree in a somewhat related field. This is because the wellness coaching industry is still in its infancy so most colleges and universities do not offer it as a major. The next best thing, therefore, is getting a minor in nutrition, fitness, anatomy, kinesiology, counseling or psychology. It’s quite a diverse field so it’s essential that you get educated. You could consider majoring in nutrition while you tack on communication as a minor; there are a lot of options out there as the industry is multi-faceted. Equipping yourself with the right information is crucial as during your one-on-one with clients, you would be required to make certain recommendations for improving the quality of life of your clients; your solutions will take into consideration their anatomy, current lifestyle, and final objectives. You would be spending a lot of time creating customizable programs for your clients as one-size does not fit all in this industry. For most coaches, the decision to pursue a career in health and wellness was not an immediate one; most often the stress, anxiety and constant feeling of agitation was a sign that it was time to get out of the rat race. These individuals one way or another sought the help of a wellness coach at some point in their lives and since then have never remained the same. The mental awareness, total freedom, the positive change on their bodies and complete eradication of health-endangering habits that come from having a health coach work with you, for some folks, spurs them on to want to lend support to others as well. This category of individuals often leave the corporate world to pursue fulfilling careers in health and wellness and have been living awesome lives. Does this image mirror your life right now? Switching over to a career in health and wellness is one of the easiest things to do as long as you have a passion for it. The school of Integrative Nutrition offers training courses for individuals looking to pursue a career in this field. With the option of online classes, you can conveniently enroll for classes from the comfort of your living room couch and take classes during your free time at work. Taking a class in communication or public speaking isn’t mandatory but could prove quite useful as communication is key to getting your message across to your various clients. People respond to different forms of communication in different ways; so you want to make sure you do not come across as judgemental or disparaging when advising your clients on the best approaches to take towards achieving their fitness goals. Be yet again reminded that there is no one size fits all in this industry. Certifications and requirements vary based on your area of specialization and the state you wish to operate out of but bare in mind that you would be required to have national certification as well. Certification programs are designed based on a variety of niches so you might want to decide on the area you wish to specialize in before undergoing the training and sitting for exams. Training can also take different forms; if you currently have a busy schedule, then you may want to look at online options that allow you study at your own pace. If distance is a problem but you still want a classroom-like feel, then look for institutions that offer live-teaching options. If you’d rather be where the action is so you can relate physically with your instructors then on-site is the way to go. American Council on Exercise: Health Coach Certification. Study on your own time with an online certification course. Level of experience - A new entrant (0-5 years experience) into this field could be taking home an annual salary of $20,000 - $40,000; while an experienced health/wellness coach (10-20 years experience) could earn as high as $50,000 - $70,000 annually. A wellness coach is required to first assess a client’s current state of health, provide some form of health related counseling to prospective clients,develop health educational materials and establish a plan for treatment. Some wellness coaches prefer to work on a one-on-one basis with their clients while others not only have individual classes but group classes as well. In their sessions, wellness coaches work with clients to develop a customized program that covers areas such as exercise, stress management, and nutrition; the sessions involve a lot of goal-setting and visioning. These individualized programs may see the wellness coach relating with the client’s health practitioner or caregiver. In some instances, the relationship could be extended to the management of the school that the client frequents; this could be done physically or virtually. They are also required to monitor the progress of their clients and make changes or recommendations when needed. Private and corporate opportunities exist in the wellness coaching industry as the demand for healthcare coaches are on a steady increase. With the National Consortium for Credentialing Health & Wellness Coaches working towards the establishment of industry standards for the health and wellness coaching industry, the future certainly does look bright for individuals looking to venture into this field. Furthermore, there has been an increasing interest in the drive to embrace a healthier lifestyle. People are becoming more conscious of their diets as well as the quality of food they consume. In 2015, sales of organic products alone hit a record $43.3 billion, that’s an 11% increase from the previous year’s sales according to a survey carried out by the Organic Trade Association. This is significant proof that people, more than ever, are making healthier lifestyle choices. What’s also great about working as a health coach is that it provides you with a flexible working schedule; most appointments are booked at your own convenience as opposed to the hustle and bustle of working for large corporations and organizations. You decide what hours you want to work and how much you want to charge for your time. It can also be done on a full-time or part-time basis; it’s really up to you. If you’ve come this far in this post, that tells a lot about your willingness and determination to pursue a career in this industry so here are some opportunities you should consider exploring. Independent Practice – This implies starting out on your own. You are primarily responsible for marketing, reaching out to new clients, developing programs and treatments in addition to conducting follow-up sessions. Insurance Industry – Health insurance companies are beginning to appreciate the work of wellness coaches as they are now employed in the insurance industry to help keep medical costs down. Medical Institutions– The role of a health coach in this setting is to conduct patient behavioral assessments; you would also be called upon to act as some sort of patient advocate, developing programs that would encourage healing and restore wellness. Sports and Fitness Facilities – The services of wellness coaches are also required in established gyms, sporting facilities and even on national sports teams. Day spas and Wellness Centers– Modern spas are improving their value proposition by engaging the services of wellness coaches; spas are now run like a one-stop shop for all your wellness needs. Corporations – Companies have discovered a new source of motivation for employees; they are recruiting wellness coaches to help employees manage stress more effectively as it has been previously established by mental health experts that wellness of company employees has a direct relationship with the company’s bottom-line. Was this post helpful? Let us know by sharing your thoughts with us in the comment section.